Panhala fort (also known as Panhalgad, Pahalla and Panalla (literally "the home of serpents")), is located in Panhala, 20 kilometres northwest of Kolhapur in Maharashtra, India. It is strategically located looking over a pass in the Sahyadri mountain range which was a major trade route from Bijapur in the interior of Maharashtra to the coastal areas. Due to its strategic location, it was the centre of several skirmishes in the Deccan involving the Marathas, the Mughals and the British East India Company, the most notable being the Battle of Pavan Khind. Here, the queen regent of Kolhapur State, Tarabai, spent her formative years. Several parts of the fort and the structures within are still intact. Panahala fort was built between 1178 and 1209 CE, one of 15 forts (others including Bavda, Bhudargad, Satara, and Vishalgad) built by the Shilahara ruler Bhoja II. It is said that aphorism Kahaan Raja Bhoj, kahan Gangu Teli is associated with this fort. A copper plate found in Satara shows that Raja Bhoja held court at Panhala from 1191–1192 CE. About 1209–10, Bhoja Raja was defeated by Singhana (1209–1247), the most powerful of the Devgiri Yadavas, and the fort subsequently passed into the hands of the Yadavas. Apparently it was not well looked after and it passed through several local chiefs. In 1376 inscriptions record the settlement of Nabhapur to the south-east of the fort. It was an outpost of the Bahamanis of Bidar. Mahmud Gawan, an influential prime minister, encamped here during the rainy season of 1469. On the establishment of the Adil Shahi dynasty of Bijapur in 1489, Panhala came under Bijapur and was fortified extensively. They built the strong ramparts and gateways of the fort which, according to tradition, took a hundred years to build. Numerous inscriptions in the fort refer to the reign of Ibrahim Adil Shah, probably Ibrahim I (1534–1557). In 1659, after the death of the Bijapur general Afzal Khan, in the ensuing confusion Shivaji Maharaj took Panhala from Bijapur. In May 1660, to win back the fort from Shivaji, Adil Shah II (1656–1672) of Bijapur sent his army under the command of Siddi Jauhar to lay siege to Panhala. Shivaji Maharaj fought back and they could not take the fort. The siege continued for 5 months, at the end of which all provisions in the fort were exhausted and Shivaji Maharaj was on the verge of being captured. Under these circumstances, Shivaji Maharaj decided that escape was the only option. He gathered a small number of soldiers along with his trusted commander Baji Prabhu Deshpande and, on 13 July 1660, they escaped in the dead of night to flee to Vishalgad. Baji Prabhu and a barber, Shiva Kashid, who looked like Shivaji Maharaj, kept the enemy engaged, giving them an impression that Shiva Kashid was actually Shivaji Maharaj. In the ensuing battle (see Battle of Pavan Khind), almost three quarters of the one thousand strong force died, including Baji Prabhu himself. The fort went to Adil Shah. It was not until 1673 that Shivaji Maharaj could occupy it permanently. When Shivaji died, Sambhaji was able to convince the garrison at Panhala to join him in overthrowing his stepbrother Rajaram, thus becoming the Chhatrapati(king) of the Maratha Empire. In 1689, when Sambhaji was imprisoned by Aurangzeb's general Takrib Khan at Sangameshwar, the Mughals came to possess the fort. However, it was re-captured in 1692 by Kashi Ranganath Sarpotdar under the guidance of Parshuram Pant Pratinidhi a Maratha garrison commander of the fort of Vishalgad. In 1701 Panhala finally surrendered to Aurangzeb, who came for it in person. On 28 April 1692 the Mughal Emperor famously received the English ambassador Sir William Norris at Panhala fort. Norris spent "300 pounds in fruitless negotiation" with Aurangzeb but the details of what was being discussed was not disclosed. Within a few months the fort was retaken by the Maratha forces under Ramchandra Pant Amatya. In 1693, Aurangzeb attacked it again. This led to another long siege in which Rajaram escaped disguised as a beggar to Gingee Fort, leaving his 14-year-old wife Tarabai in Panhala. As Aurangzeb pursued Rajaram, Tarabai would stay at Panhala for almost five years before meeting her husband again. During this formative period of her life, Tarabai looked after the administration of the fort, resolved disputes and gained the respect of the people. The time she spent at Panhala provided her with experience in courtly matters and the support of her officers, which would influence later events. Rajaram did send reinforcements from Gingee, and Panhala came into Maratha hands in October 1693. In 1700, Rajaram, died leaving behind a 12-year-old son—Shivaji II—by his wife Tarabai. In 1705, Tarabai asserted her autonomy by founding an independent dynasty in the name of her son Shivaji II and ruling it as regent with Panhala as her headquarters. In Tarabai's war with Shahuji of Satara in 1708, Shahu took Panhala and Tarabai fled to Malvan in Ratnagiri. Shortly after, in 1709, Tarabai again took Panhala, established a separate state (Kolhapur Rajaram by his second wife Rajasbai succeeded to the throne. He died without issue in 1760. His widow Jijabai adopted the son of a Sahaji Bhonsle of Kanvat. Thus, Jijabai became the acting regent during the time that her adopted son was a minor. She came to believe that to prevent the fall of Panhala, the Mahakali shrine at the fort had to be ritually offered human blood for the appeasement of Goddess Kali. She would periodically send out her soldiers at night to scour the neighboring villages for victims. This practice would continue until her death in 1772. One of the towers near where these sacrifices occurred is still called the Kali tower. There were reports of Jijabai bestowing a plot of land to an oilman or Teli in return for the grant of his daughter-in-law to be buried alive under one of the Panhala towers. A shrine to the Teli's daughter-in-law (Gangubai) was subsequently erected and it is still a pilgrimage site for the people of the Teli community. In 1782, the seat of the Kolhapur government was moved from Panhala to Kolhapur. In 1827, under Shahaji I (1821–1837), Panhala and its neighboring fort Pavangad were given over to the British Raj. In 1844, during the minority of Shivaji IV (1837–1860), Panhala and Pavangad were taken by rebels who seized Colonel Ovans, the Resident of Satara, when he was on tour and imprisoned him in Panhala. A British force under General Delamotte was sent against the rebels and on 1 December 1844 breached the fort wall, took it by storm, and dismantled the fortifications. Thereafter, a British garrison was always left to guard the fort. The administration of the fort remained with Kolhapur until 1947. It is one of the largest forts in the Deccan, with a perimeter of 14 km (9 mi) and 110 lookout posts. It is 845 m (2,772 ft) above sea level. This fort is built on the Sahyadris, rising more than 400 m (1,312 ft) above its surrounding plain. Numerous underground tunnels stretch out from underneath the fort, one of which is almost 1 km long. Most of the architecture is of the Bijapuri style with the peacock motif of the Bahmani Sultanate prominently visible on several structures. Some of the older bastions also have the lotus motif of Bhoja II. There are several monuments at the fort which are considered notable by the Archaeological Survey of India. Whenever an army besieged a fort, their first action was to poison the main water source of the fort. To counter this, Adil Shah commissioned the building of the Andhar Bavadi (Hidden Well). This is a three-storey structure with winding staircases that conceal the well which was the main water source for Panhala fort. There are recesses in the wall so that soldiers can be permanently stationed. Several hidden escape routes in the Andhar Bavai lead outside the fort. With its own water source, living quarters and its own exit routes, likely this structure was designed like a fort within a fort with the intention of making it an emergency shelter in case the main fort fell. The Amberkhana, situated in the center of the fort, were three granaries built in the Bijapuri style of architecture. They enabled Shivaji to withstand a 5-month siege by Siddhi Johar. It consists of three buildings called the Ganga, Yamuna and Saraswati Kothis. The Ganga kothi, which was the largest, had a capacity of 25,000 khandis (with one khandi being 650 lbs). It covers an area of 950 sq m and is 10.5 m high. Rice, nachni and warai were the major provisions stored. Stairs on both sides lead the top of the buildings. It has sixteen bays each with its own flat vault with a hole on top through which grain used to be passed. The eastern entrance has a domed chamber with a balconey and plasterwork of the Bijapuri style. This was an additional granary next to the three granaries that constituted the Amberkhana. It was a stone building 55 feet by 48 feet by 35 feet high. This has an entrance and a staircase that leads to the terrace. Grain was distributed from here to the needy. Sajja Kothi is a one-storey structure built by Ibrahim Adil Shah in 1500 CE. It is also built in the Bijapuri style. Sajja Kothi was constructed as a viewing pavilion looking over the valley below. The domed upper chambers have faceted pendentives with the balconies hanging over the ramparts of the fort. This is where Shivaji imprisoned his son, Sambhaji, when he threatened to defect to Aurangzeb. The Teen Darwaza was one of the three double gateways of the fort - the others being the Char Darwaja and Wagh Darwaja. The Char Darwaza was destroyed when during the British siege. The Teen Darwaja gate which is the main entrance to the fort is located north of the Andhar Bavai on the West side of the fort. It is a double gate with a court in between that has arcades. The outer gate has an ornate chamber on top with decorated eaves. The inner gate from the court is highly decorated with the lintel having finely carved motifs, including one of Ganesh. The latter has been placed by the Marathas during their occupation of the fort. There are three Persian inscriptions—one on top and one each on either side. All three declare that the gate "was built in the reign of Ibrahim Adil Shah I by Malik Daud Aki son of Minister Ahmed" in 954 AH (1534 CE). This was another entrance to the fort. It was designed to elude invaders such that they would get trapped into a small courtyard and could then be easily neutralized. It has an elaborate Ganesh motif at the entrance. The Rajdindi bastion was one of the hidden exits of the fort to be used in times of an emergency. It was used by Shivaji to escape to Vishalgad during the Battle of Pavan Khind. Rajdindi is still intact. There are temples devoted to Sambhaji II, Someshwar and Ambabai in addition to the Mahakali temple. The Ambabai temple is very old and it was here that Shivaji would make offerings before embarking on major expeditions. The mausoleum of Jijabai lies opposite to that of her husband, Sambhaji II. Ramchandra Pant Amatya (who wrote Adnyapatra, a treatise on Maratha policy) was the youngest minister in Shivaji's fort. He died at Panhala fort and a mausoleum was erected here for him and his wife. The mausoleums were covered with rubble till 1941 and till 1999 had not undergone any restoration work. Also a mausoleum to Moropant an 18th-century Marathi poet who wrote poetry in the adjacent Parashar caves can be seen. A shrine to a Muslim saint Sadhoba is also present. The palace of Tarabai, arguably the fort's most famous resident, is still intact. It is now used to house a school, several government offices and a boys' hostel. The rest of the fort is in ruins though the structures within the fort are frequented by tourists who visit Panhala town- a major hill station. It has been declared as a protected monument by the government. Wikimedia Commons has media related to Panhala Fort. "Translations of Panhala inscriptions". Government of Maharashtra. Retrieved 2009-03-19. ^ a b Eaton, Richard Maxwell (2005). The New Cambridge History of India. Cambridge University Press. pp. 180–194. ISBN 0-521-25484-1. Retrieved 2009-01-28. ^ a b c d e f g h i j k Gazetteer of the Bombay Presidency. Bombay, India: Govt Central Press. 1866. pp. 314–315. Retrieved 14 March 2009. ^ a b Eastwick, Edward B. (1881). Handbook of the Bombay Presidency: With an Account of Bombay City (2 ed.). John Murray. pp. 268–269. Retrieved 2009-01-30. ^ Kulkarni, A.R. (1996). Marathas and the Marathas Country. Books and Books. Retrieved 2009-01-28. ^ "siddi johar". Retrieved 27 March 2017. ^ Indian Institute of Public Administration Maharashtra Regional Branch (1975). Shivaji and Swarajya. Orient Longman. Retrieved 2009-01-28. ^ Rana, Bhawan Singh. Chhatrapati Shivaji. Diamond Books. pp. 40–42. ISBN 81-288-0826-5. Retrieved 2009-01-28. ^ Gordon, Stewart (1993). The Marathas, 1600–1818. Cambridge University Press. ISBN 0-521-26883-4. Retrieved 2009-01-28. ^ Takakhav, Nilkant Sadashiv; Kr̥shṇarāva Arjuna Keḷūsakara (1985). Life of Shivaji, Founder of the Maratha Empire. Sunita Publications. Retrieved 2009-01-28. ^ a b Gupta. Glimpses of Indian History. Anmol Publications PVT. LTD. pp. 96–97. ISBN 81-261-1186-0. Retrieved 2009-01-28. ^ Krishna, Bal (1940). Shivaji the Great. Arya Book Depot. Retrieved 2009-01-28. ^ a b Agrawal, Ashwini (1993). Studies in Mughal History. Motilal Banarsidass. p. 167. ISBN 81-208-2326-5. Retrieved 2009-01-30. ^ Kulkarni, A.R. ; Nayeem, M.A (2000). History of Modern Deccan. Abul Kalam Azad Oriental Research Institute. Retrieved 2009-01-28. ^ a b c Srinivasam, V. "A Long Weekend in Kolhapur". Retrieved 2009-01-31. ^ Divekar, V. D. (1993). South India in 1857 War of Independence. Lokmanya Tilak Smarak Trust. p. 163. Retrieved 2009-01-28. ^ a b Imperial Gazetteer of India. Sup. Govt. Print. 1909. p. 523. Retrieved 2009-01-28. ^ "List of monuments by the Archaeological Survey of India". Government of India. 2008. Retrieved 2009-03-16. ^ a b c d e Gunaji, Milind (2005). Offbeat Tracks in Maharashtra. Popular Prakashan. pp. 29–31. ISBN 978-81-7154-669-5. Retrieved 2009-01-28. ^ a b c Keating, Richard; John Murray; Arthur Hamilton Gordon; Charles Edward Buckland; George William David Starck Forrest; Norwood Young (1898). A handbook for travellers in India, Burma and Ceylon (3 ed.). J. Murray. p. 299. Retrieved 2009-03-16. ^ Nath, R. (2006). History of Mughal Architecture (Illustrated ed.). Abhinav Publications. ISBN 81-7017-414-7. Retrieved 2009-03-17. ^ Sarkar, Jagadish Narayan (1974). Some Aspects of Military Thinking and Practice in Medieval India. Ratna Prakashan. Retrieved 2009-01-28. ^ a b c d "Maharashtra State Tourism Website". Retrieved 2009-01-28. ^ a b c d Forbes, Geraldine; B. R. Tomlinson; Sugata Bose; Stewart Gordon; J. S. Grewal; P. J. Marshall; C. A. The new Cambridge history of India. Cambridge University Press. pp. 44–45. ISBN 0-521-56321-6. Retrieved 2009-03-16. ^ Directorate of Tourism Maharashtra (India) (1962). A Panorama of Maharashtra. Govt. Central Press. Retrieved 2009-01-30. 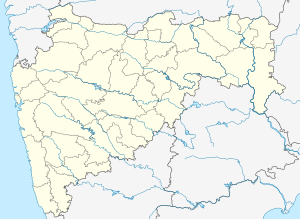 ^ a b "Kolhapur District Gazetteer". Government of India. Retrieved 2009-03-16. ^ Jathar, Dayanesh (May 1, 1999). "Shivaji's minister awaits a fair deal". Indian Express. Retrieved 2009-03-16. ^ "List of the protected monuments of Mumbai Circle district-wise" (PDF). This page was last edited on 23 February 2019, at 19:33 (UTC).